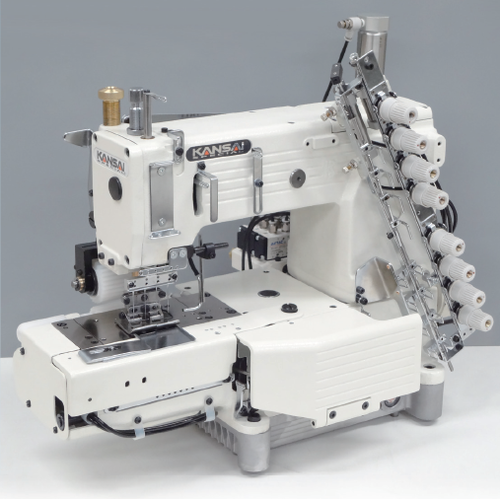 FX series is a versatile multi-needle, cylinder bed, double chain stitch machine with vertical looper movement mechanism. This machine is specialized in attaching pre-closed elastic bands to sweat pants, pajamas, trunks and similar garments. Major features of this series are the wide range of available gauge size (4～21 needle), cylinder bed (420mm in circumference), elastic expanding device(RT-1) and rear puller mechanism. Pneumatic thread cutter(UTC) system increases productivity by trimming threads accurately and leaving less thread. This can save threads and labor cost.